Skipper Marc Richards says he is ‘pleased and happy’ to have committed his short-term future to the Cobblers after he put pen to paper on a new one-year deal at Sixfields. The 34-year-old has been the club’s top-scorer for the past two seasons, and is on course to make it a hat-trick this term as he currently heads the charts with 13 goals with just one game of the campaign to go. He has been one of the first names on Justin Edinburgh’s teamsheet since he took over from Rob Page in mid-January, and the manager believes Richards still has a lot to offer, both on and off the pitch, labelling the former Chesterfield man ‘a leader’. 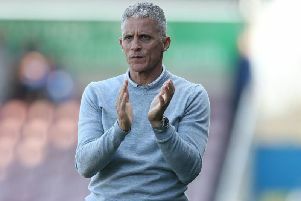 Richards had made no secret of the fact he wanted to stay at the Cobblers after enjoying three successful seasons in his second spell at Sixfields, and he is delighted to have committed again. “It is nice to go into the summer now knowing that my immediate future, and short-term future, is sorted,” said the Town skipper. “It is never nice to go into the close of the season and not knowing where you are going to be plying your trade come the next season. “I am pleased and happy that the gaffer and chairman and the rest of the staff that are involved in the club have shown the faith in me to give me another deal. “It can be a rat race at times as there are that many players out of contract come the summer. Richards follows John-Joe O’Toole in committing his future to the Cobblers, with the midfielder having signed a two-year contract on Friday. And the striker is grateful that he has been given the chance to extend his career in the claret and white. “I am thankful for the opportunity that the gaffer is going to give me to go out there and to try and play football like I have been for the past two or three years here,” said Richards, who turns 35 in July. It has been a good season for Richards, who had to force his way back into the team after being regularly overlooked in the early months of the season under Page. He didn’t score a league goal until the 1-1 draw at Scunthorpe in October, but has since taken his overall tally to 13 with one game to game to go, although he admits that tally could have been a little higher. “I should have a few more goals to be honest,” said Richards. “There were a couple of penalties here and there, and there were a couple of chances I should have put away and I would be close to 15 or 16 goals. Richards will be hoping to add to that 13-goal tally when he leads the line in the final game of the Sky Bet League One season against Gillingham at Sixfields on Sunday (ko midday). The Cobblers go into that game under no pressure as they secured their survival last weekend, but the visitors need a win to guarantee they will stay up.